Welcome to Nottinghamshire Amateur Swimming Association. Nottinghamshire ASA have now published details and full Entry Pack for the 2019 Summer Gala. Full information can be found on our County Competition Pages here. 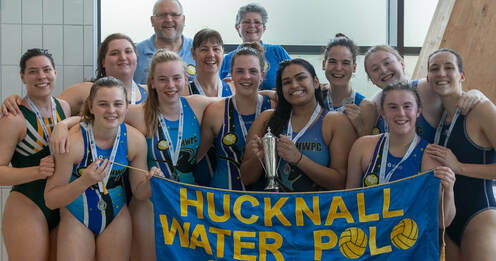 The meeting of the top two teams to decide the women’s Championship 1 winners produced a comfortable 12-6 victory for Hucknall over Sheffield Sharks at Liverpool. All smiles from new champions Hucknall at Liverpool. Front, L-R: Mia Lovell, Eda Colliver, Giorgia Bosworth, Naya Patel, Anna Loyd. Second row: Katelyn Fairchild, Cara Saunders, Helen Reader, Marta Gasso, India Wilkinson, Carlene Piquard. Back: Tim Dunsbee (coach), Mary-Clare Endy. After an even start, Hucknall steadily took control, India Wilkinson leading the way with four goals. Other scorers were Katelyn Fairchild (2), Anna Lord (2), Marta Gasso, Cara Saunders, Charlene Piquard and Eda Colliver. Larissa Partridge was outstanding for Sheffield, scoring all their goals. The other matches during the final session all ended in single-goal victories. Mid Sussex Marlins won for the first time, 14-13 against Tyldesley, scoring vital goals late on by Lauren Hand (2), Isobel Bates and Eve Tidy. Liverpool Liver Birds beat City of Bristol 7-6 thanks to Katie Bowater’s fifth goal just seconds from the end. City of Birmingham ended their campaign in style, beating Leeds Sharks 7-6, including four goals from Sancha Tonks. Hucknall, Sheffield and Leeds start next season in Division 1. 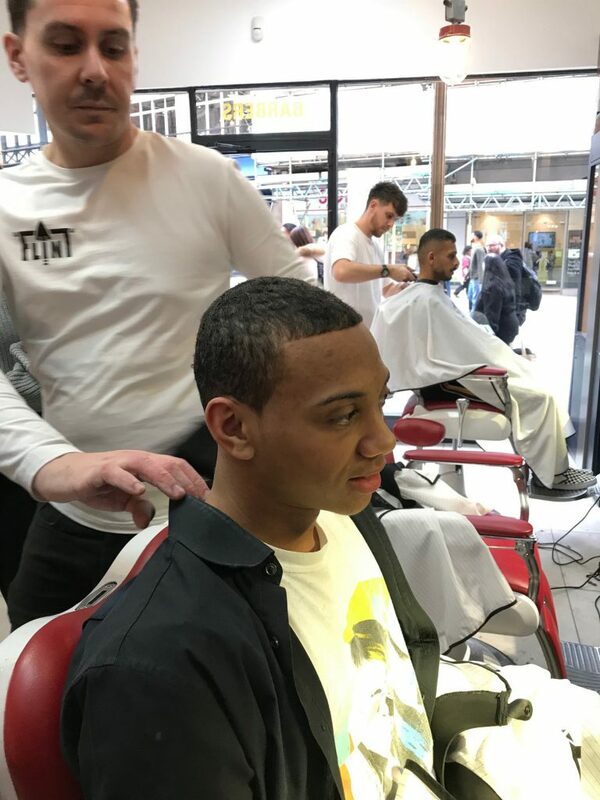 Gabriel Oyaide-Nicholls (Nottingham Leander and NOVA Centurion swimmer) is well known in the Nottinghamshire swimming community not only for his swimming but for his amazing hair. 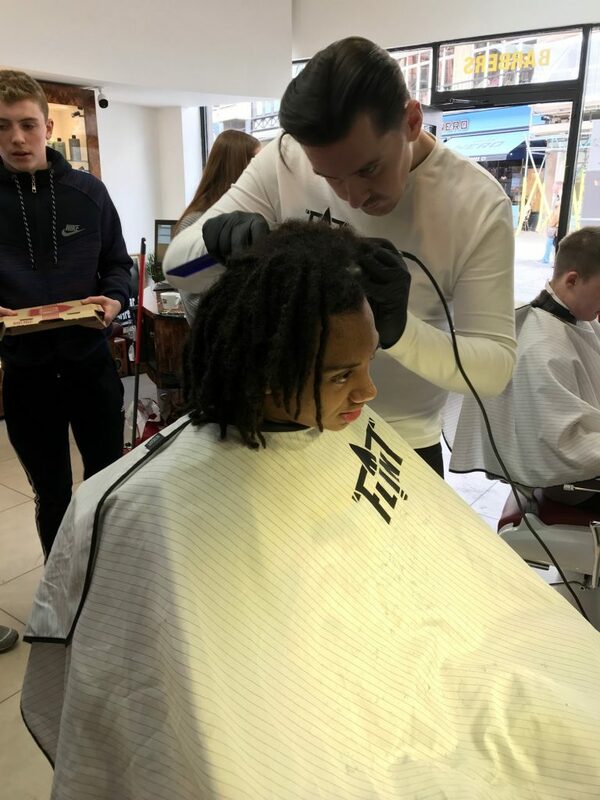 On Saturday 2nd March, to raise money for a charity very close to the family, Gabriel was sponsored by lots of people inside and outside the swimming world to have all of his locks chopped off. Gabriel went to Flint’s barbers in the city with some of his swimming friend for support and made a celebration out of it. Altogether Gabriel has raised a total of £854.55 which is a massive success and way over his initial target of £500. Lisa (Gabriel’s mum) has said she is “extremely proud of him”, along with all of his friends in Nottinghamshire swimming. The 2018 Nottinghamshire AGM will take place at Bonnington Theatre, Arnold Leisure Centre, Arnold, Nottingham, NG5 7EE. This will be a 10:00am meet with the meeting starting at 10:30am. Breakfast rolls will be available from around 10:00am. All clubs are welcome to send up to 3 voting delegates, along with all Notts ASA Past Presidents. The position of head coach at Nottingham Leander SC has become available recently. If you have an in-depth knowledge of competitive swimming but have a passion for all levels of swimming, are a great communicator, motivator and organiser who can deliver engaging sets to swimmers of diverse abilities across a wide age range – we want to hear from you. Nottingham Leander SC are looking for a Director of Swimming to lead, mentor and support our dedicated team of coaches and help them deliver high-quality training opportunities across all our sessions. They will also liaise with the Senior, Masters, Junior and Development Coaches to select teams and ensure our swimmers are well prepared for the various competitions they enter. We anticipate that the post holder will coach 4 sessions per week, visit all club sessions on a regular basis and be poolside at the competitions the Club enters. This is a part-time post and attracts a competitive rate of pay commensurate with the selected candidates’ experience and qualifications. Due to time restrictions on the competition we have now had to close entries. We do have a list running to fill empty lanes on races but these are limited. The Notts ASA Festive Frenzy is filling up fast. We will only be able to accept a few more entries before we will need to look at closing and just filling up empty spaces. It is with deep regret that we have to inform you of Christine Greaves death. Chris had a massive stroke last week and despite 3 brain operations, she was unable to recover and sadly passed away in Queens Medical Centre with her beloved husband Gren and her family by her side. Chris and Gren devoted over 30 years each to Sutton in Ashfield Swimming Club and they are the reason that the Club is here and so successful today. Chris was the Chair of this Club for many, many years before handing over to Andy Quinn at the clubs 2013 Annual General Meeting. Put simply Chris was an incredible and really formidable lady. In her capacity as Chair she saw this Club through some really difficult times which I know impacted on her personally. Her ability to guide the Club so excellently over so many years is true testament to her strength of character and her determination to succeed. Chris in her time as Chair ensured there was a long term vision for the Club which would see it continue to grow and so her planning and budget management was always with an eye to the future. The Club continue to benefit from Christine’s vision today. Chris was so much more than just the Chair of the Club for so many years. She voluntarily performed a number of other duties including becoming a qualified official, coach and was the Girls Team Manager for the vast majority of her 30 or so years with the Club. I can not imagine how many hours Christine devoted to our Club over the years. I will be forever grateful for the time she spent as the main coach to both my own daughters as they progressed through the lanes at Sutton. The Team Manager role alone is not an easy one at the best of times. Selecting the teams, ensuring selected swimmers are available and then managing them all on poolside on a Saturday night can be quite stressful but Chris loved this role and had such a fantastic way with all her swimmers. Both Gren and Chris were made Honorary lifetime members of our Club in recognition of all they did for us. Both Gren and Chris like so many of us that now volunteer for the Club got involved in swimming as a result of their daughters, Wendy and Sally joining the Club when they were very young. Both were talented swimmers and made mum Chris very proud of their achievements with Wendy going all the way to representing Great Britain in the pool. No matter how much time Chris devoted to swimming and our Club she always had a higher priority and quite rightly that priority was her family. Chris was a loving and devoted wife, mother and grandma and my heart felt condolences and prayers are with her family members right now as they all struggle to come to terms with her passing.